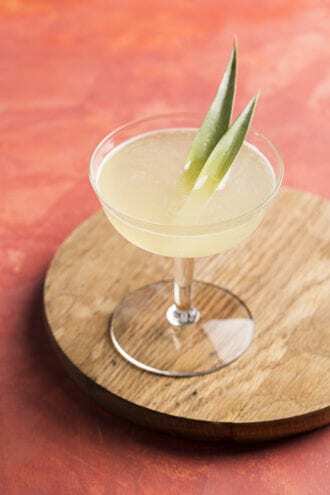 A double pineapple infusion makes the house daiquiri at BlackTail extra breezy. Shake all the ingredients with ice to chill, then strain into a chilled glass. Sous vide instructions: Peel, core and chop 150 grams of fresh pineapple into small chunks, then place them in a 1-gallon zip-seal plastic bag along with one 750 ml. bottle of white rum. Remove all air from the bag (following the instructions here) and place it in a water bath heated with an immersion circulator to 45 degrees Celsius; let cook for 6 hours. Immerse the bag in an ice bath to cool, then strain the solids from the infused rum and bottle the rum for storage. Use within 2 weeks. Standard infusion: Peel, core and chop half a pineapple into small chunks and add to a jar along with one 750 ml. bottle of white rum. Seal the jar and let the mixture soak for 4 to 24 hours, depending on how intense of a pineapple flavor you desire. Strain the solids from the infused rum and bottle for storage; use within 2 weeks.